33 Variations is a powerful drama taking place between present day and the years 1819-1822. The two locations are Bonn, Germany and New York City. 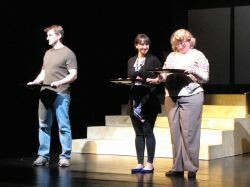 The Reston Community Players cast and crew told an outstanding story with high drama, balanced with laughter and rapid fire playing by a pianist. The use of the pianist helps to set the stage as well and allow the drama to help tell the story. 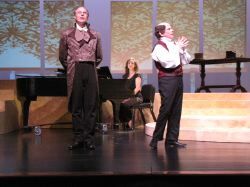 Dr. Katherine Brandt (Mary-Anne Sullivan) is a woman on a quest to uncover the reason behind Ludwig Von Beethoven’s writing 33 variations of a mediocre waltz. When she learns she has Amyotrophic Lateral Sclerosis (ALS), also known as “Lou Gehrig’s Disease,” her quest becomes an obsession as she works feverishly to uncover the truth before her body shuts down. Once in Bonn she meets Dr. Gertrude Laudenburger at the library in Bonn where some of Beethoven’s oldest works are kept. 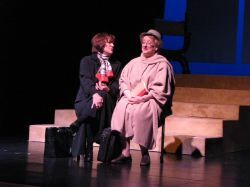 Played perfectly by Gayle Nichols-Grimes, Dr. Laudenburger is a bit of a crusty woman at first and is very protective of Beethoven’s writings and various manuscripts. As Katherine’s disease becomes more and more debilitating, the relationship between the two women grows stronger. The next relationship takes a little longer to work out. This is the relationship between Dr. Brandt who has never settled or achieved mediocrity and her daughter Clara (Arianne Warner) who is still finding her place in life. The two women mix like oil and Vodka and spend most of their time arguing. It is not until Clara meets Mike that she begins to see her mother in a new way. 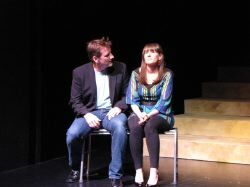 Mike (Kevin Walker) is Katherine’s nurse and Clara’s boyfriend, which makes for the occasional conflict of interest. Mike is a decent guy, although he has this ability to say the wrong thing at the wrong time and ends up compounding the problem. Yet his innocence is so funny, both he and Gertrude or “Gertie” have some of the funniest lines that allow for some serious laughter that is so very much-needed in this intensely dramatic work. All the present day actors move and interact so well together that they seem to be one piece. There is the cymbals crash as tempers flare as the anger and feelings are exposed. It is all part of the music. We now move back in time to see the lives of Ludwig Von Beethoven, his faithful servant Anton Schindler and Italian composer Anton Diabelli. Mario Font as Diabelli maintained his accent faithfully throughout the performance. Font’s character was hyper and easily disturbed. His typical Italian hand-wringing and fast talking was humorous to observe. Fast-paced pieces of music were reminiscent of Diabelli. Anton Schindler was played calmly by Richard Bird. In a sense he was the 1819 nurse to Beethoven that Mike was in present day to Katherine Brandt. He was the calmer musical moments. Bird had slight inconsistencies in his accent, but it did not diminish his character. Finally Mr. Ludwig Von Beethoven himself was an artist in every way. Untamable, inconsolable, loud, emotional to the hilt, he was bigger than life. 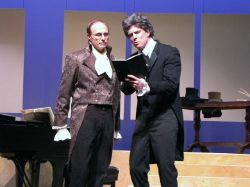 Played by Allen McRae, Beethoven met his impending deafness with as much drama as he did everything else. His accent was subtle which was a little disappointing, but he made up for it in his emotional outbursts and recreating music in his head, which he could no longer physically hear, but in his head was a thing of beauty. It was fascinating to watch the 33 Variations unfold as the pieces told the story. Both casts intertwined well together, with pianist Hilary Van Wagenen Henry playing wonderfully on center stage as the play unfolded around the music she played. 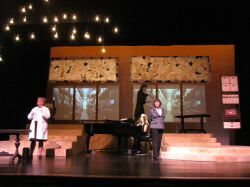 Set designer Kevin King and Cathy Rieder kept the set itself to a minimum to allow the story to come out in the actors, with only a few raised platforms and a few small pieces to be brought on and off as needed. 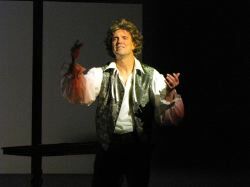 Jon Roberts’ projections were well done and enhanced the story on stage. 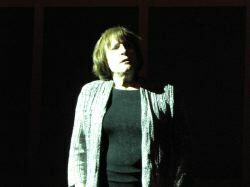 Director Sue Pinkman made fine use of the stage by keeping the action either moving, or allowing the high dramatic moments from the dialogue to keep you glued to the action on stage. A truly moving performance by a tightly knit group of people who are equal in their quest to tell a story. Add to that a crew who is well versed in their own movements and instructions and you have a stellar, must-see show. Everyone knows “a little” Beethoven (I would hum a few bars for you right now if I could)! And everyone knows that “one of those genius composers” of the 18th or 19th Century was deaf. Mozart was popularized in the movie (and the play) Amadeus, but it takes a real classical music “buff” to realize and understand the scope of Beethoven’s work… and it is outrageously amazing (to say the least)! Doing some research for directing this how I’ve only scratched the surface, which is exactly the reason I tend to choose scripts like this…. to practice my own kind of obsession, community theatre. I dare say I would NEVER compare myself (or my ‘bizarre hobby’) to this incredible musician, who was a tortured soul from the time he was a child; who lived among royalty; who had to compose sonatas at the whim of every duke and duchess; and who lost his hearing during the last half of his brief 57-year life. But in a small way, I can certainly relate to the urgency and the passion it takes to create a work of art. Each season , you can find well over 200 theatre productions to attend in the DC area… and that’s not even counting the professionals at Arena Stage or the Kennedy Center. That’s JUST volunteer community theatres and high school productions! Believe me, that’s a LOT of talent, designing painting, building, sewing, singing, and dancing…. and a lot of creativity… and, yes, passion. Thank you for supporting your friends, neighbors, children and grandchildren. You never know when another Beethoven might just walk in the door! This article can be linked to as: http://showbizradio.com/go/9425.